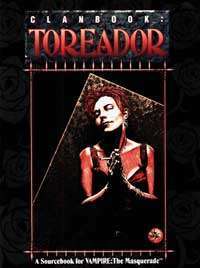 Potentially the mightiest of the vampire clans, Toreador is also the most divided clan, paralyzed by bitter infighting. For millennia, their world-shaking battles within the clan have been just as intense as their relentless struggles against other Kindred. no other clan has had such an effect on the world of mortals. No other clan can match the effect of the Toreador. Calnbook: Toreador includes: the history of the clan and the roles it has played in both human and vampiric culture; ten sample characters suitable for players and Storytellers; the secrets of how the Toreador use their arts to destroy their enemies.